This morning we all had a great sleep in and after some breakfast we decided to check out a Diamaru Department store that was shown on a map in one of my food guides. It was close by so we thought it could be a nice easy option. The girls at reception told us they had never heard of a Diamaru in the location on my map but as usual we ignored their advice. We caught a taxi to the location that my map showed several department stores but there wasn't much to see save for a few construction sites. I rechecked my book and noted that it was first printed in 1995 and although reprinted in 2005 it was obviously a bit outdated and a food guide not a shopping guide so obviously the priority on updating the maps with the latest department stores was not a high priority! This was not a major problem as we took a short walk to the nearest BTS station and caught the skytrain to Siam Paragon. Tina was still focused on finding at least one pair of jeans in an attempt to keep up with my shopping efforts. To let Tina focus on shopping I took Charlie for a couple of hours and decided to check out DAISO which is a Japanese $2 store that Colin had spoken highly of. After a bit of wandering around I found a 3 level store in Siam Square. It's quite an interesting store with lots of Japanese plastic gadgets and bits and pieces all priced at 60 Baht. I had read that these stores were the latest craze in Bangkok. I found it quite interesting and bought a few items. Soon after leaving, Charlie passed out and I met up with Tina. She had finally found some jeans and was starting to catch up with my efforts. It didn't last long though as I found a great pair if boots by J Shoes and quickly extended my lead. As Tina had covered the ladies department pretty well we headed for the men's clothes where I found 5 fantastic shirts by Paul Marc. Obviously this put me in an unassailable position so in sympathy we went to the ladies shoes department where Tina found a great pair of Italian leather ladies thongs. I decided that I needed a leather belt so I left Tina with Charlie and went back to the men's department. After about 20 minutes I didn't find anything and sent Tina a text to meet at the level 2 VAT refund counter. This is where you apply for VAT refunds that can be claimed at the airport. After about 10 minutes Tina showed up looking very worried as she had lost her phone and only found me out of sheer luck. I tried to call the phone but couldn't get through. Just as we where thinking the worst some of the department store staff came running over holding Tina's phone! All extremely lucky really. We thanked them profusely and headed for the exit. 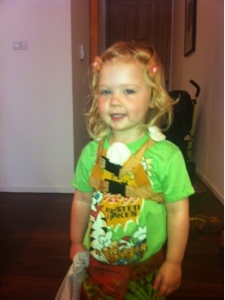 We were just about clear when Tina spotted some singlets. She had been looking for some for a while so of course we stopped and she quickly purchased four of them. Not a bad days shopping really. We were obviously pretty hungry by this stage and while we had snacked on some Obanyaki (I mistakenly called these Takoyaki in a previous post) from the vendor in Siam Square near Som Tum Nua it was time to get some proper lunch. We opted to get the skytrain back to Thong Lo station and get food from Sukhumvit Soi 38. 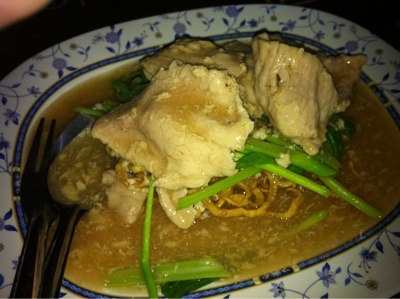 I had some lovely crunchy noodles with pork in gravy, I think this is call Rad Nar but I'm not too sure. 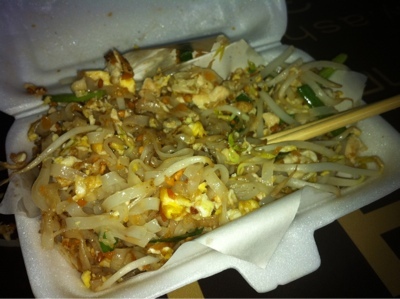 Tina went for Pad Thai and maybe because we were starving it was delicious and probably the best Pad Thai so far.